Joe Muckleroy began his legal career in 2005 at the Las Vegas law firm of Henness & Haight, Injury Attorneys. After two years at Henness & Haight, Joe joined the Nye County District Attorney’s Office as a Deputy District Attorney. At the D.A.’s office, Joe successfully prosecuted complex criminal cases, including manslaughter, drug trafficking, sexual assault, and felony D.U.I. 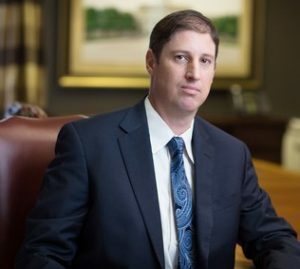 In 2009, Joe left the district attorney’s office to return to his native Southeast Texas and join Brasher Law Firm, PLLC. At Clint Brasher’s law firm, Joe is dedicated to helping victims of serious injuries recover everything they are entitled from those responsible and fighting for homeowners underpaid or denied by their insurance company. In his free time, Joe enjoys spending time with his wife and two children.